Dan Yaccarino is not only an author and illustrator of children's books . . . He is the creator and producer of several children's television series . . .
And he speaks at schools, too . 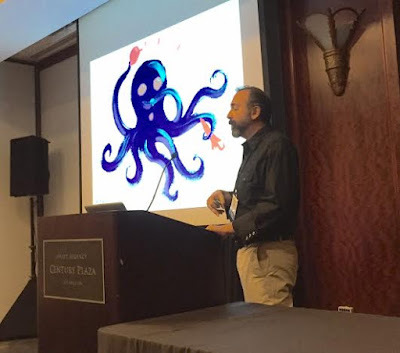 . .
We were lucky to have him hear at #LA15SCBWI . . . In his breakout session, Yaccarino spoke about developing characters for his books and television shows — The Backyardigans, Oswald, Willa's Wild Life. It was crazy fun to watch him talk about his characters, as well as interact with them as he presented. Know your characterer. Spend a lot of time drawing and redrawing them to develop what they will look like. Remember, color can evoke a character's personality, even when aren't doing anything. What does red say about a character? What about yellow? Consider what a character's function is—what do they do? A T-Rex who plays a piano? You should know your character's personality just by looking at them. Describe your character. What do they like, dislike? What do they value in life? Once you nail your character's personality, the story will start to emerge. Characters need to be pliable, they need to motivate action outside the real of the story so that you can you easily plop them into another plot line. Be sure that your characters look like they belonged in the same world. The Backyardigans are made up of five different animals of different colors and shapes, but they all look like they live in the same world. And remember, the characters design will dictate what that world looks like. Create empathy for a character by making them humanlike. At one point, it was Yaccarino's thought that Doug Unplugged, a robot, would be able to turn his head around a full 360-degrees. A bit on the Exrocists side, huh. That quality is not humanlike and will turn young readers off. A story is merely a vehicle to showcase your character, an excuse to reveal the character over and over again.